PDFCool Studio provides up to 31 kinds of skins, so that the user can choose the skin they like to customize the program style. Show the name of current skin used in program. The function dialog displays working sketches of the 31 kinds of skins provided by PDFCool Studio, so that the users can choose the skin they liked more conveniently. Double clicking the working sketch of a skin, you can have a skin preview. When click on the Apply button, you can replace the program¡¯s current skin with the skin you chosen. In the "Change Skins" process, if the program didn't change the skin automatically after double clicking the new skin name, the user can click on Refresh to retry that operation. The user can remove the current skin temporarily. When the selected skin failed to apply because of clashing with the system environment (usually refer to the tools bar), you can choose this mode. 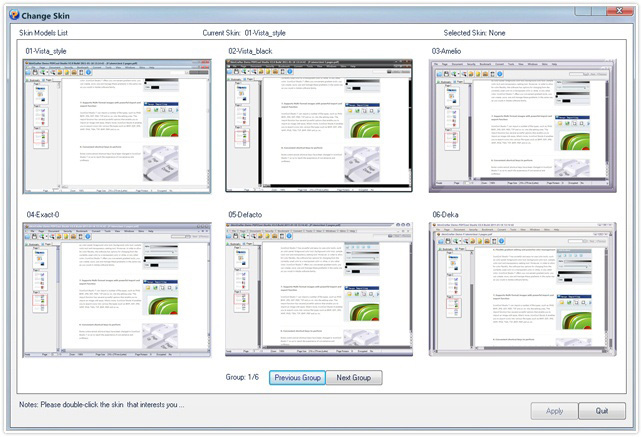 PDFCool Studio provides 31 kinds of skins, and the user can click the skin name to change program skin. It lists the skins downloaded from the website http: //www. skincrafter. com/gallery. For more details about user skins, please read the following item. From the website http: //www. skincrafter. com/gallery, you can download various kinds of skins and apply to your software. To install the skin, firstly choose and download the skin you liked from url above. After the downloading, you should open the download folder to copy the files to the Userskins folder in your PDFCool installation directory. Then, restart the PDFCool program, you can find the skins you downloaded in the User Skin List.